Jamna Auto Industries is in portfolio of Anuj Anantrai Sheth. He is one of the top investors in India. The company belongs to Auto Ancillary sector. As per the Company website it is India’s largest, and amongst world’s third largest, manufacturer of tapered leaf springs and parabolic springs for automobiles. The Company was first to introduce parabolic springs in India. It has nine manufacturing facilities at Yamuna Nagar, Malanpur, Jamshedpur, Pune, Chennai, Pilliapakkam, Hosure and Lucknow. It has 64% market share in India OEM segment. The customer list includes Ashok Leyland, Force Motors, Tata Motors and Volvo etc. The plants are approved by GM-USA, Ford-Europe and Diamler-Europe for supply of multileaf and parabolic spring. The stock is a multibaggar giving more than 60 times return in above long term price chart. Though it had periods of under performance in year 2009 due to global crisis and again from year 2012 to 2014. Majority of price appreciation came in recent bull run as is the case with majority of stocks in Stock Exchanges.I liked the dividend yield of the Company which is more than 1.5% at current market price. 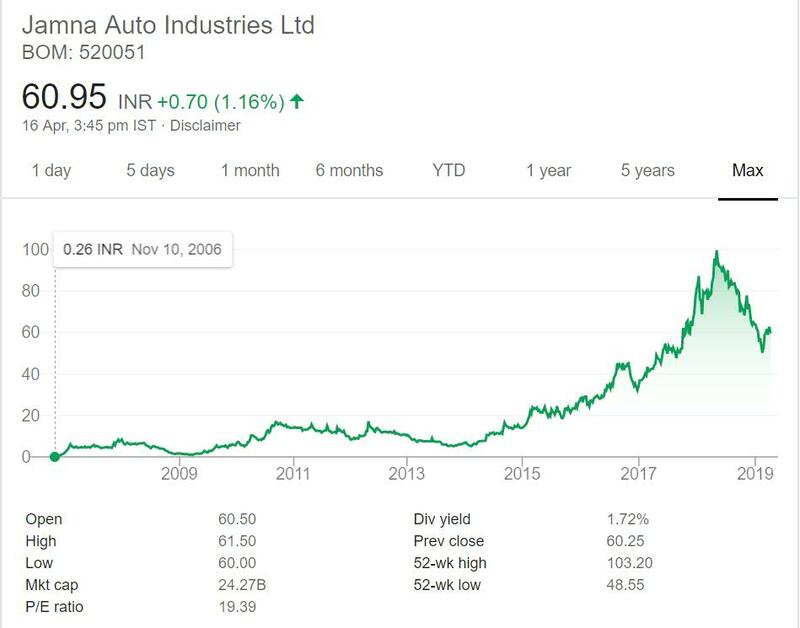 Jamna Auto Industries is a Auto Ancillary Company.It has whopping 64% market share as per Company claims in India. This is monopoly like situation for the Company. Auto Ancillary sector is growth sector. It is entirely dependent on growth of Indian Auto Industry mainly. Few companies do export products to other Countries as well. Suspension system will not be impacted by growth or transition from Petroleum or Diesel based vehicles to Electrical vehicles. This fact makes it unique Company in Auto Ancillary sector. I am bullish on Auto Ancillary sector. It will cater needs of Indian Auto Industry and with time companies can look overseas market as well. As of now I have auto ancillary company in my portfolio and do not want to increase exposure in it.